Ms HAT Hang campaigning in Banan district against domestic violence. 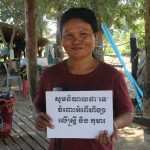 Ms HAT Hang, through TPO’s Improving Mental Health for Survivors of Gender-Based Violence & Sexual Assault Community Mental Health Program, has made the transformation from a victim of domestic violence to a community leader advocating for the rights of others. Mr HEM Soeurn encourages other survivors of human rights abuses to speak out. Mr. HEM Soeurn, a farmer from Battambang, had to endure the most inhumane treatment imaginable during his imprisonment by the Khmer Rouge, but he lived to tell the tale. 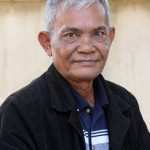 After specialized trauma treatment by TPO Cambodia through our Truth, Reconciliation & Healing – Towards a Shared Future project, he is now strongly committed to sharing stories of human rights violations during Khmer Rouge times and encourages other torture survivors to speak out.